Element Racing is a division within National Waters Eventing Corporation. For the past 10 years, we have been designing, developing, producing and enhancing events and companies which specialize in the active outdoor industry, with a specialty in non-road adventure production. What is non-road adventure production you may ask? Non-road adventure production is any event or activity with a primary focus on, or framed within, the natural environment. These activities can take place both on land and/or on water, and the location can vary widely from urban to rural to remote. Designing, marketing and guiding local and international adventure travel vacations for individuals and groups. These trips include hiking, canoeing and kayak focused trips to destinations ranging from North America, New Zealand, Iceland, Belize. Specializing in non-road activities, James has built and grown several companies which include Element Racing- a company dedicated to providing race-oriented events that get participants outdoors and into nature. Although competitive in nature, these events attract athletes from a broad spectrum- from recreation enthusiasts to pro athletes. Event design – From conception to production, we have built brand new grass roots events, and have helped to evolve/enhance and overhaul existing events. Having done this provides us with hands-on experience for every aspect of event production from design, marketing, and added value activities, to activation and production. Course design – Developing an event concept is the starting block. Right from this conceptual phase we ensure proper flow, while incorporating crowd control, and taking into account external and internal variables to ensure that the event is safe and that the participant, spectator AND sponsor experience is a positive one. Event Assistance – Let us take on a special project within your event so you can concentrate on the larger picture. Permitting and Sanctioning – Probably the most difficult and least enjoyable part of putting an event together is the permitting and sanctioning process. We have the experience to obtain the required paperwork efficiently- which allows you to focus on the fun stuff! 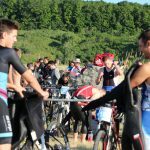 Race Directing/Co-directing/Assisting – Not everyone wants to be a race director; others do, but would like to have some support and experience by their side. In other cases, the event/project is so large that additional support is needed to get the job done. We are able to assist in event production in a range of capacities. Map production – While a concept map will get you started, eventually an event may need a more professional look. The map and and event website is typically the first impression of your event- it is important that this impression reflects the type and quality of the event that you want participants to experience. We have the tools and expertise to recreate GPS accurate maps complete with elevation profiles and course features. Website design specific for events – Working with our web design team, we create event-specific and highly functional sites which make it easy for event owners to make future updates and changes on their own. We have built events from the ground up. Let us help you with yours! Contact us to discuss your event needs.